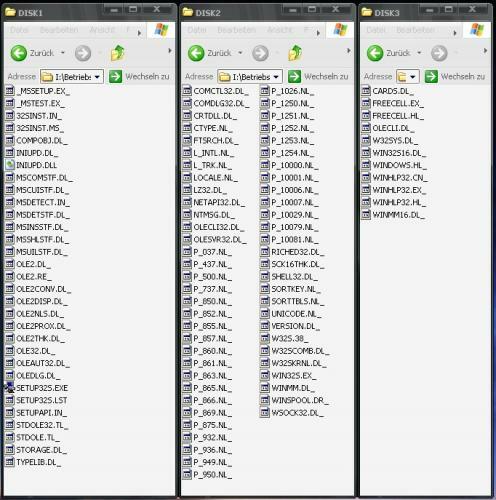 Problem is, it extracts into one folder. There were originally three disks. It will install fine from a single folder but I'm trying to reconstruct the original disks. I can't figure out which files were on which disks. I figure it's in this file somewhere. Can anyone help? 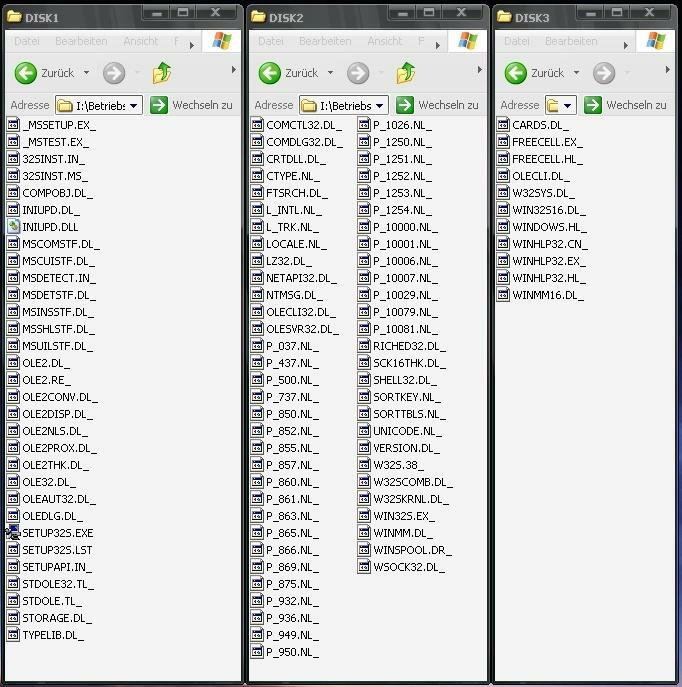 "1", "Microsoft Win32s Setup Disk 1", "ole32.dll", "." "2", "Microsoft Win32s Setup Disk 2", "sortkey.nls", "." "3", "Microsoft Win32s Setup Disk 3", "winhlp32.exe", "." Disk 1 contains all files in alphabetical order up to ole32.dll. Disk 2 contains all files in alphabetical order from ole32.dll to sortkey.nls. Disk 3 contains all files in alphabetical order from sortkey.nls to winhlp32.exe. Of course, I'm not exactly sure if these are right but that's what it sort of looks like. Hrm, no. That seemed to make sense though. The strange thing is that it's 5.59MB, which doesn't fit onto three 1.44MB floppy disks... Now I'm confused. They might have been like the Windows 95 disks and had slightly larger floppy disks than the standard 1.44MB kind. That was my first thought but then they ended up being larger than 1.44MB. I didn't know they had to be compressed, thanks. To my knowledge, compress.exe adds them to a CAB file and to work with the installation, the CAB files need to be that exact same compression. Despite the name "Windows Server 2003 Resource Kit", it will work on Windows XP. Okay, will the setup utility be able to decompress them in DOS? I already found one that says it's for DOS. Cant you just format a floppy with WinImage to 1.65MB? It will Stretch a 1.44MB to 1.65MB floppy. The files like this: 123.BM_ are already compressed. Yeah that's the thing that I mentioned earlier. Like the old Windows 95 disks used to be. I lost insterest in trying to reconstruct the disks, I would be interested in actually having them though on 1.44 floppies. If you have the disks could you make an image of them so that it preserves the labels and everything too? I like all my software as precisely backed up as possible.